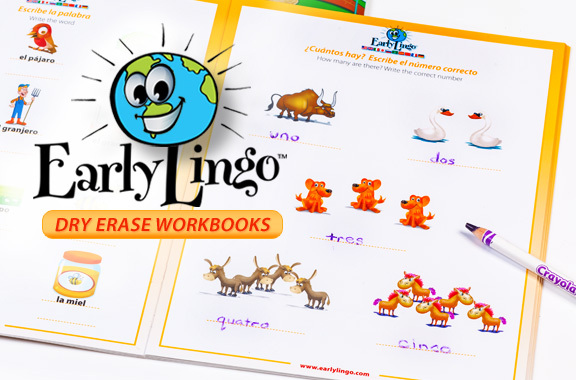 The Early Lingo Spanish Language Learning System is the first of its kind, offering animated and live-action videos, workbooks and lessons, apps and flashcards that teach your child the basic foundation of a foreign language. The award-winning DVD series is organized into 6 interactive programs using a playful approach to learning with stimulating visual content of everyday activities featuring the animated characters, Jojo and Lulu. Please find our products below. You can watch a preview of each DVD or click to buy directly. As an added bonus, you can also order the full Early Lingo Spanish 6-DVD Box Set and save! Spend an exciting day at the park with Jojo & Lulu learning all about different colors and shapes. A day at the beach with Jojo and Lulu to learn about opposites and words for things found at the beach. Go to school with Jojo and Lulu and learn the alphabet and words for things in and around the classroom. Shop with Jojo and Lulu at various markets and learn words for different foods and things found in the kitchen. Jojo travels to various cities to find Lulu. Help him search and learn the words for things found in the city. If you love Early Lingo, you’ll love our new Spanish Language learning System DVD Box Set discount! Get all 6 DVDs & SAVE!